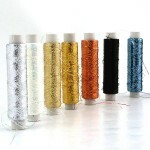 A pack of 8 different coloured spools of fine, sparkling metallic glitter thread of approx. 200m each. Eight spools of very fine sparkling metallic threads to add a glistening effect to your projects in two dazzling colour combinations. 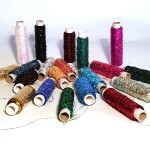 The glitter is supported by an invisible nylon yarn to give it strength and reduce stretching and breaking. It needs it - the thread is one 69th of an inch in thickness! Please note that the colour selection may vary slightly from the images but are based on the colours listed. Although the Lurex has a length of nylon for support it isn’t the strongest thread in the world, so use with care especially when using it on its own, particularly in embroidery and cross-stitch techniques. 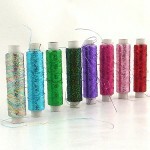 Work with the glitter on the bobbin (working back to front) or use a metallic needle for best results. Ply with another yarn for a more subtle twinkle when hand or machine knitting, crocheting and weaving. Metallic threads like these make excellent additions to Christmas crafting in card making, cross-stitch, spirelli, braids and tassels, canvas work - brilliant for a bit of festive sparkle. These small spools have a fabulous meterage so go much further than you would expect. The mixed pack gives you a wide range of colours for minimal expense.